Teemu Pukki has been named as the Championship’s Player of the Season. The Norwich City striker has been integral to a campaign that has seen them storm to the top of the Championship and edge close to a return to the Premier League. Pukki, who signed on a free transfer in the summer, is the top scorer in the Championship with 26 goals and has also provided nine assists for his team-mates. He beat Sheffield United’s Billy Sharp and Birmingham City’s Che Adams to the honour on Sunday evening. Pukki said: ‘It’s an honour to win this award, I’m really happy for the recognition. I have really enjoyed this season so far in what is a fantastic league, but we know there are still many big games to come. 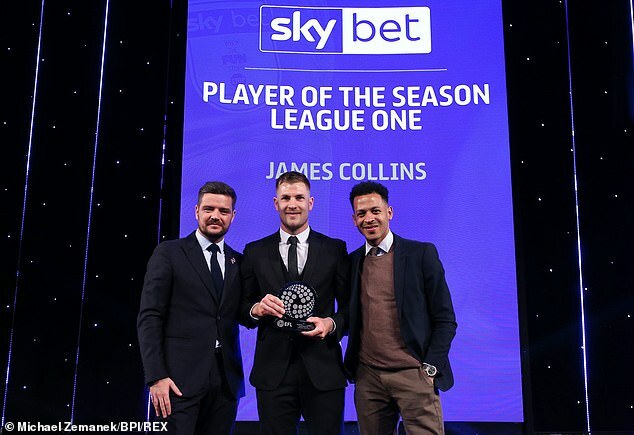 Luton Town forward James Collins was given the League One Player of the Season gong. 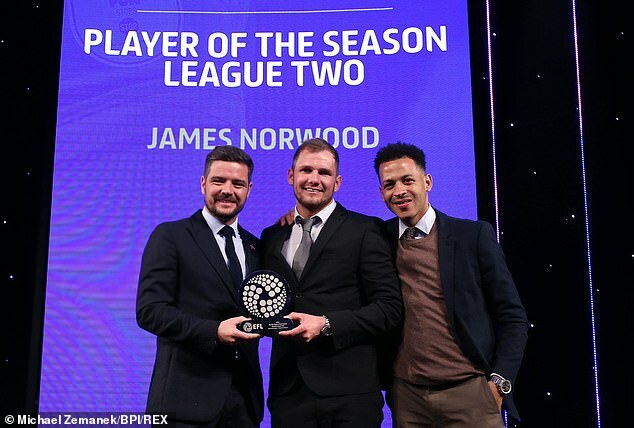 James Norwood, meanwhile, was handed the League Two equivalent. Collins said: ‘Obviously this is a really proud moment for me personally, it’s been a great season so far both personally and for the team. 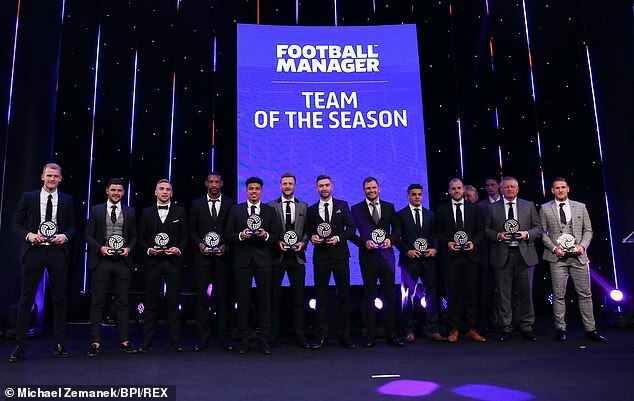 The overall EFL team of the year was named as Adam Davies (Barnsley), Max Aarons (Norwich), Liam Cooper (Leeds), Krystian Pearce (Mansfield), James Justin (Luton), Alex Mowatt (Barnsley), Jay O’Shea (Bury), Jarrod Bowen (Hull), Teemu Pukki (Norwich), Billy Sharp (Sheffield United) and Norwood (Tranmere Rovers). Sheffield United’s Chris Wilder was named as the manager for the team of the season. 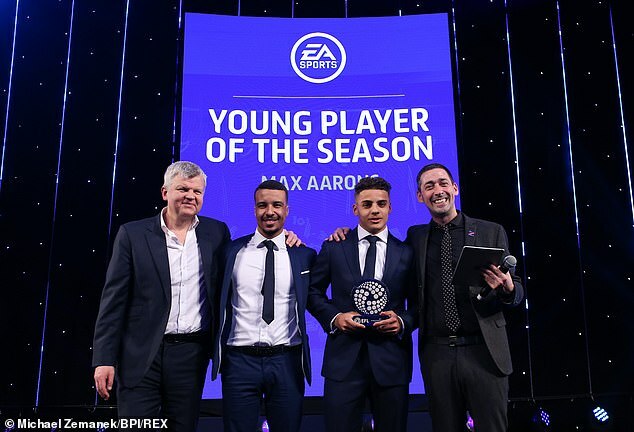 Norwich full-back Max Aarons was named the EFL Young Player of the Season. 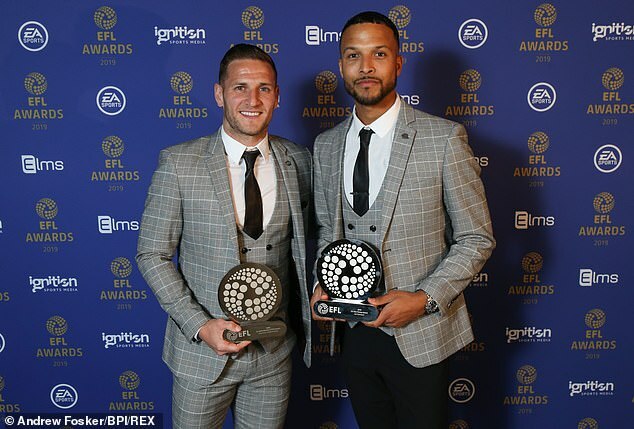 Former Rochdale player Joe Thompson, who beat cancer twice and scored a crucial goal at the end of last season to keep his side in League One, was awarded the 2019 Sir Tom Finney Award. Doncaster Rovers were handed the Family Club of the Year honour while Sharp was handed the Moment of the Season award for scoring his 220th goal this century. Will Vaulks was named the Community Player of the Year and Portsmouth received the Community Club of the Year honour.